It’s a sorting algorithm, in which each pair of adjacent items are compared and swapped if they are in wrong order. The comparison is repeated until no swaps are needed, indicating that the list is sorted. The smaller elements ‘bubble’ to the top of the list, hence, the name Bubble Sort. 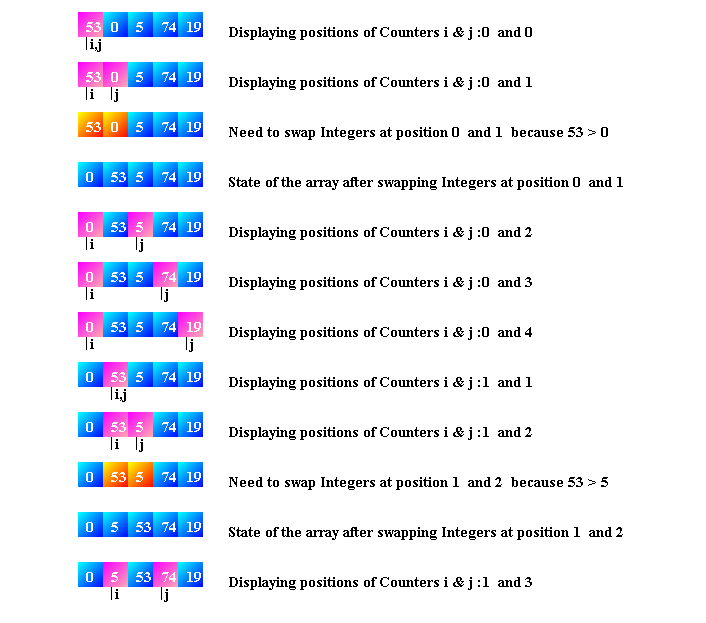 In this like selection sort, after every pass the largest element moves to the highest index position of the list. 1. Compare two adjacent elements and check if they are in correct order (that is second one has to be greater than the first). 2. Swap them if they are not in correct order. 1. If value of the second item at position iter is lesser than the value of the first item i.e. at position iter-1, then swap them. 2. Else, move to the next element at position iter+1. The effective size of the list is hence reduced by one after every pass and the largest element is moved to its final position in the sorted array. Repeat the two steps until the list is sorted and no swap is required i.e. the effective size is reduced to 1. 1. Best Case performance – When the list is already sorted, we require only one pass to check, hence O(n). 2. Worst Case performance – When the list is in the reverse order, n number of comparisons and swap are required to be done n number of times, hence O(n2). 4. It does not require any extra space for sorting, hence O(1) extra space. to be greater than the first). (ii) Swap them if they are not in correct order.